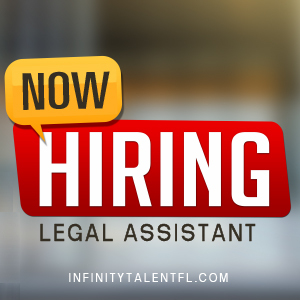 Downtown boutique Plaintiff’s Labor & Employment firm is seeking a Case Investigator with at least 5+ years of law firm experience, preferably with labor & employment and litigation experience. Case Investigators represent the law firm in a prospective client’s first communication with the firm. They investigate the facts that the prospective client presents and must make timely and accurate decisions based on their communications with the client. Case Investigators provide opportunities to the law firm by patiently listening to prospective new clients, systematically eliciting and recording the information from the prospective client (along with information which the firm requires a new client to provide). While interacting with the prospective clients, Case Investigators evaluate the information they have elicited and recorded against new client profiles which determine whether the prospective client can be assisted. This requires that Case Investigator learns the types of claims that the lawyers in the law firm handle and the specific details which are necessary to bring such claims. Case Investigators must be able to apply that learned knowledge in their telephone communication with prospective new clients in order to provide accurate factual information with which the firm can prepare demand letters and court filings without further interactions with prospective clients. Case Investigators must carefully provide prospective clients with accurate information about the firm’s processes, including whether or not the firm can assist the client, and be able to persuade prospective clients that they may end their search for legal representation pending a final decision on representation. At all times during their interactions with prospective clients, Case Investigators must be poised and patient in eliciting and receiving information while guiding the prospective client to provide the data that is critical to the representation decision. Case Investigators must function in a team environment, communicate effectively in written and oral communications, systematically record information and timely complete related tasks utilizing software for follow-up communication and scheduling. Case Investigators must also preserve the confidentiality of prospective clients. Advanced proficiency in Microsoft Suite and tech savviness are a PLUS! Firm offers a generous benefits package and compensation in the mid to high $40’s.